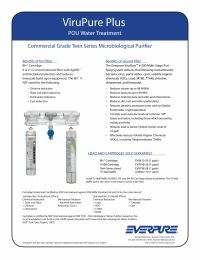 The Everpure ViruPure Plus Commercial Grade Twin Series Microbiological Purifier features Everpure's unique ViruPure hollow membrane technology, which reduces bacteria, virus, particulate and cysts as small as 0.019 microns. The ViruPure Plus leaves the vital minerals found naturally in water, and controls even extreme levels of common "off" tastes and odors, providing the best tasting water possible. The Everpure ViruPure Plus Commercial Grade Twin Series Microbiological Purifier reduces the following contaminants: bacteria, virus, particulates, cysts, volatile organic chemicals (VOC), lead, MTBE, TTHM, chlorine, chloramine and limescale. Install Tri Wall Baffle (EV8002-79) into the BH Cartridge before installation. The Tri Wall Baffle opens the valve in the head to allow water flow.